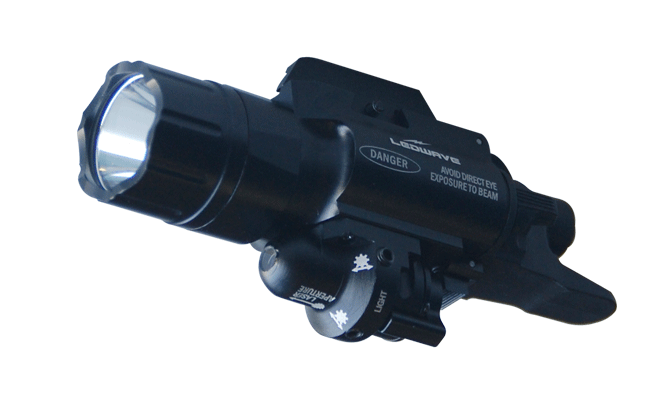 Tactical flashlight with CREE LED and Laser technology specially designed for police and military units to be used in short weapons or submachine guns. It has three light sources: White Led, Red Laser and IR laser 940 nM. Compatible with the majority Picatinny rails in the market, Weaver, Glock, etc. Lens is made of Pyrex, super resistant to impacts and heat. Two interchangeable operating modes through the lid that is used to cover the battery compartment. In this lid there are 3 pressure switches, one to active each mode, and the other has a remote switch cable (included) which has a system to fix it to the weapon frame using “velcro” and a powerful adhesive. IMPORTANT: IR functions require a night vision device (Not included). Compatible with 1st, 2nd and 3rd IR generation systems. Tactical flashlight with LED CREE technology specially designed for police and military units to be used in short or long weapons. Lens made of Pyrex, super resistant to impacts and heat. Two interchangeable operating modes: One cassette with 3 pressure switch and a remote switch cable (included). It has a system to fix it to the weapon frame with “velcro” and a powerful adhesive. It works with 2 Lithium CR123A batteries (Included). Range of lumens 600. More than 50,000 hours of LED life. time, you can also ignite the Red laser pointer to lock-up your target, ensuring a 100% striking rate. will only make your shooting operation more confidence. to medium-range engagements in law enforcement, military and self-defense applications. light beam for the Cree Led. the tailcap and close the tailcap. throughout the flashlight to protect the LED module. of recoil, which means it rarely needs to be re-zeroed. purchase date. Batteries are not included in the warranty. different state of charge. Never try to recharge regular (primary) batteries. If using rechargeable Li-ion batteries. with rechargeable batteries in this flashlight. Keep batteries away from children. night) in a person’s eyes, even at great distances. Never look into the laser emitter, either directly or indirectly (via reflection). Never aim the laser beam at eyes, either directly or indirectly (via refection). Never view the beam with optical instruments (telescopes, binoculars, etc.). Never open or modify the laser housing. Use the laser sight only for its intended purpose.